There are many ways to give back to your community, but one of the greatest ways could be by being involved with the a public library, a place filled with books that could educate people of all ages on almost anything you could want to learn about—and it’s all accessible for free. Barbara Baltimore was a volunteer with the San Luis Obispo County Library for many years, and to this day her efforts have continued to help libraries throughout the county. Her involvement endures with the Barbara Baltimore Library Endowment that was started in 2011 with $195,000 bequest to the Foundation for Santa Luis Obispo County Public Libraries. The endowment started a yearly grant program with Baltimore’s mission in mind: to fund projects that have a lasting value for the community and enhance libraries countywide. GENEROSITY: The Barbara Baltimore Library Endowment is helping enhance the learning materials for Spanish language individuals of all ages. This time around, the Barbara Baltimore Library Endowment awarded the foundation $14,000—of which $10,000 was used to purchase Spanish-language materials for each of the libraries within the county. According to the last updated U.S. Census (2015), about 22 percent of SLO County is of Hispanic or Latino descent, with the number on the rise. Joan Decker, chair of the Barbara Baltimore Committee, said the committee received a request that the grant money be used to upgrade the bilingual materials in the county libraries. She said that the letter called for improvement of Spanish language materials as children’s books had been circulated more than 16,000 times and adult collections more than 1,300 times. 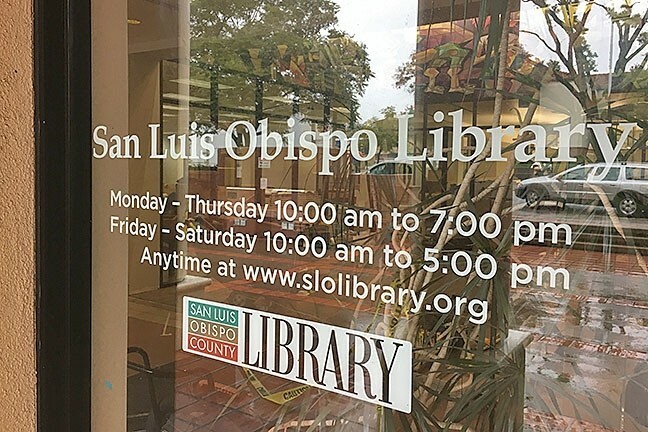 “The reason that we awarded the money toward these materials is because 14 percent of San Luis Obispo County speaks Spanish, and we wanted to improve our bilingual section in the library for them,” Decker said. She said that in communities such as San Miguel and San Simeon, a little more than half the demographic is Spanish speaking and look to their public libraries as a main source of reading materials. As the Spanish speaking population increases, libraries in the county can now continue to expand their children’s, young adult, and adult Spanish language materials. The Big Laugh’s ninth annual Valentine’s Comedy and Live Music event is benefiting local rescue Second Chance at Love Humane Society. The Feb. 11 event will host comedians such as Mike Mancini, Comedy Central’s Kira Soltanovich, and HBO’s James P. Conolly. Doors open at 6 p.m. with the comedy beginning at 8 p.m. Tickets start at $30 at the Atascadero Lake Pavilion; for more information visit biglaughlive.com. Feb. 18 and 19 is the Estero Bay Surf Club’s infamous Big, Bad, and Ugly Surf Invitational, with longboard and shortboard contests as well as a dinner and raffle event with the club. For more information, visit morrobay.org. Big Brothers Big Sisters community support fundraisers raised a record $126,000 for the organization, making it possible for the agency to serve 260 mentor matches during 2017. The agency will need continued community support in the form of donations to support those new matches as well as volunteers to serve as mentors. For more information on volunteering or donating to Big Brothers Big Sisters, call 781-3226 or visit slobigs.org. New Times Staff Writer Karen Garcia wrote this week’s Strokes and Plugs. Send tips to strokes@newtimesslo.com.